I was watching the Isle of Wight documentary from 1970 at a friend's house the other night, and having never seen it, I was curious to see some of the legendary performances that are always written about. The performances were indeed mind blowing, but I came away with an entirely different take on that famous festival: that the emergence of the original Napster was in fact nothing new, but rather the latest skirmish in the battle for putting a price on music. The Isle of Wight Festival, not unlike Woodstock a year earlier, revolved around the battle between the organizers and promoters who took major risks financially, and a large portion of the audience who felt that the festivals should be free. This ultimately lead to an ugly conflict that resulted in the organizers and some of the musicians performing at the festival losing money or not getting paid. The act of fans physically tearing down walls at Isle of Wight in 1970 is not dissimilar to the attitude that has led to the collapse of the traditional music business. Despite a rock bottom price of £3 for a three day festival featuring the top talent of the day (Hendrix, Doors, The Who, Joni Mitchell), only one out of 10 people paid. Obviously this was a sign of the turbulent times. But still, talk about disrespect. 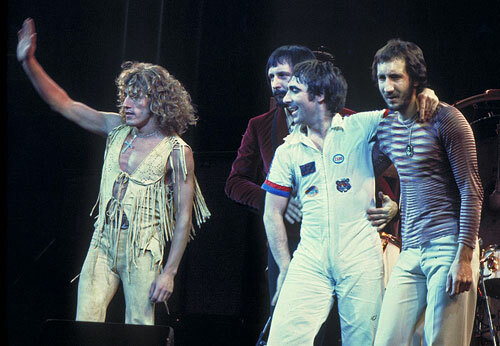 The Who in 1975. Photo: Jim Summaria. Today, fans tear down "pay walls" the same way by deciding that they should be able to download their favorite music for free rather than pay a reasonable price. Though they do not appear as aggressive as breaking down fences and running into a festival, these simple clicks of the mouse rob the artists and those who work with them just as significantly... if not more so. There are many that applaud the decline citing the greed of the artists, labels, promoters and the lack of quality new music. And although there is some truth to these observations, without a financial infrastructure to keep finding and releasing new music, the options for discovering and nurturing talent naturally decreases. Should we be surprised that the rise of Idol has coincided with so many disposable artists finding traction when it's much harder and more costly to stick with and build an artist's career? The sense of entitlement for downloading music without paying for it means that the wishes of the artist don't count. To paraphrase an interview Joan Baez gave during this concert: shouldn't it be up to me if I want to give a free concert? Yes, in fact, it should. Radiohead chose to give away their music for whatever price (or free) that fans wanted to pay. That was Radiohead's choice. The Grateful Dead had an implicit pact with their fans... tape what you want, share with friends, we'll do a lot of benefit concerts, but our deal is you pay to see us in concert. And if you want to buy our recordings, you do. A thing to keep in mind if you don't like corporate sponsors and feel their impact has ruined an otherwise pure creative process - that's nothing new either - look to its origins in Bach or Mozart, who could only support themselves at the beneficence of the court. If it sounds like I'm taking sides with the artists and the labels... I am. Those who take creative and financial risks deserve the rewards. Labels have learned the hard way that the days of fans paying an exorbitant price for a CD that has one good song are over. But surely $.99 or $1.29 for a song you know you like is not too much to ask a fan to pay. And fans will still turn out to support full CDs that have a number of strong songs by keeping them on the charts week after week, as we have seen with Eminem and Lady Gaga. 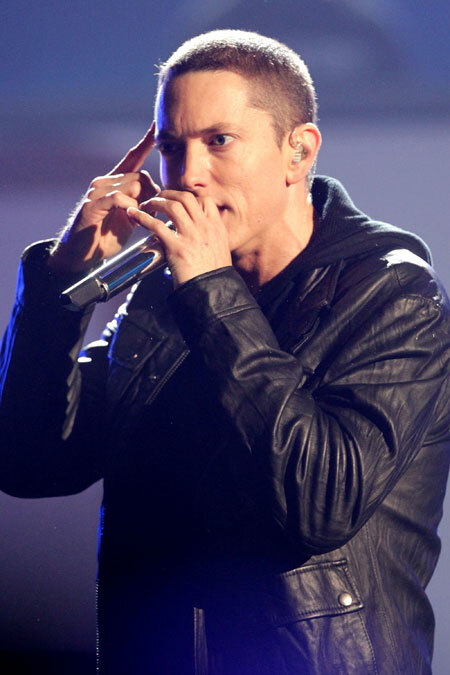 Eminem at 2010 BET Awards. Photo: Frederick M. Brown/Getty Images. The phrase "Music isn't as good as it used to be" seems to be repeated every 10 years by each generation that doesn't like or understand new music, bemoaning a loss of "real artistry" and nothing but commerce controlling music. I completely understand the yearning for authenticity and the fact that much of the new music cannot compare to the transcendent bands. How often have you heard someone describe a new band as sounding like Pink Floyd? Doesn't happen, right? Well truthfully, such bands are extremely rare, regardless of the decade. But just because at any given moment there may not be an artist or band as great as The Who, Stevie Wonder, Neil Young or Marvin Gaye, it doesn't mean that there aren't many up and coming worthy artists and bands in every genre that deserve our attention. It just so happens there are a lot of good artists and music right now, ranging from B.o.B to Arcade Fire, The Rescues to Death Cab for Cutie, Ryan Bingham to Mumford and Son, Muse to Jamey Johnson, and a lot more. 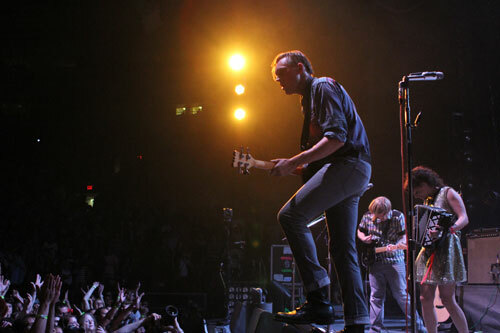 Arcade Fire at Madison Square Garden. Photo: Cory Schwartz. As for the quality of music, what was performed at the Isle of Wight was undeniably great, but still a majority felt it should have been free. Nothing much has changed. People keep saying that no one will pay for music, but however you want to look at it, artists and labels are paying the price for this free fall and so will we. Sensible and portable subscription is coming, support it or not. But if you're a fan of music then support your favorite artists, whether they're a huge band or an up and coming indie artist. Respect the creative process and let's pay a fair price for the music that enriches our lives.